As I enter the last week of this 30-day-challenge, I realize that today’s challenge is one of the most important ones thus far. Be firm, not harsh. If you’ve read my earlier challenges, you would notice words like “frustrated and “blood boiling.” This month, I’ve successfully limited my yelling. Still, when my buttons are pushed, especially during a temper tantrum, I snap and say things I probably shouldn’t say. Truth be told, I don’t think I’ve ever said anything particularly hurtful but it doesn’t take much for my ultra sensitive kids to get their feelings hurt. Or, just the tone itself upsets them. More often, they are entirely unfazed by what I said, not understanding my underlying sarcasm, but I feel badly for having said it. For me, challenges Day 2, Day 3, Day 5, and today all go hand in hand: compliment more, yell less, and try to help them understand the importance of behaving a certain way (without saying because “I told you so.”) I’m still using our reward chart app which helps me tremendously. Rather than losing my temper, I remind them, “well you just lost another star” or “you could have gotten a star for following directions just now.” That seems to be enough for my kids lately. This morning, my daughter earned herself a time-out. This all started, mind you, because she wasn’t happy with the way I styled her ponytail. She pulled it out, told me she wasn’t coming with us, and tried to run out the front door. When I caught her, she smirked. Yes, my five-year-old smirked. I’m sure I yelled. I didn’t however say that she was acting like a baby or that I didn’t want her to come anyway or anything else from the monologue taking place in my head. I took a deep breath, and after the time-out, opened the door, asked for an apology, and packed us in the car. We spent the day at a festival, just me and them. Within the first half hour, both of them separately became very moody. Moody in my world involves a combination of a scowl and dropping to the floor in a mini-meltdown. So, yes, they were moody, pulling on my giant bag, pulling, pulling, and whining. Oh, did I have some words for them on the tip of my tongue. But I put my challenge-face on, focused them on their star chart, got them a snack to get their blood sugar level back up, and warned them that there could be no more outbursts or else we would make the hour drive back home. You know what? Miraculously, they were amazing for the entire day. Even when my son accidentally spilled the contents of his overpriced lemonade all over my leg, despite my warnings to be careful, and even, an hour later, when my daughter spilled half her gazpacho on the blanket next to me, I stayed absolutely calm. I sealed my lips (very tightly) and cleaned everything up. Done and done. Putting it all in perspective, my kids are still so young. Sometimes, I forget that. Speaking of forgetting, here is tomorrow’s challenge . 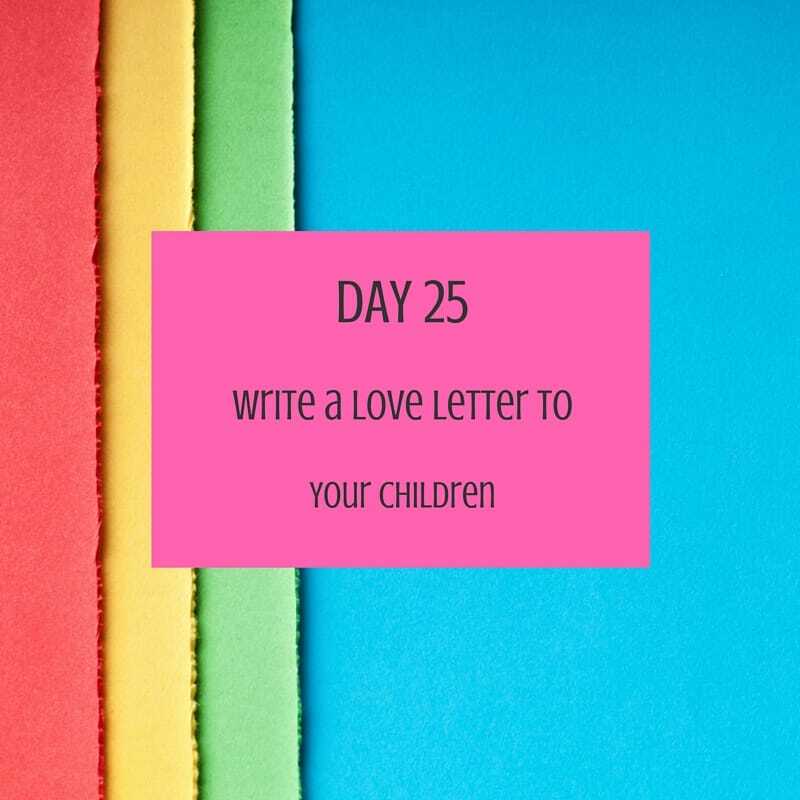 . .
I’ve read about mothers who write letters to their children every year on their birthdays. I’ve never done that. The closest I’ve ever come to writing a letter is sticking a friendly note in a lunchbox (once). But tomorrow, I’m going to write a short letter to each of them and file it away. Oh dear! As the 30-Day Challenge nears its end I find myself already missing the daily dose of humor, wisdom and goal-setting… Thanks for keeping with it!